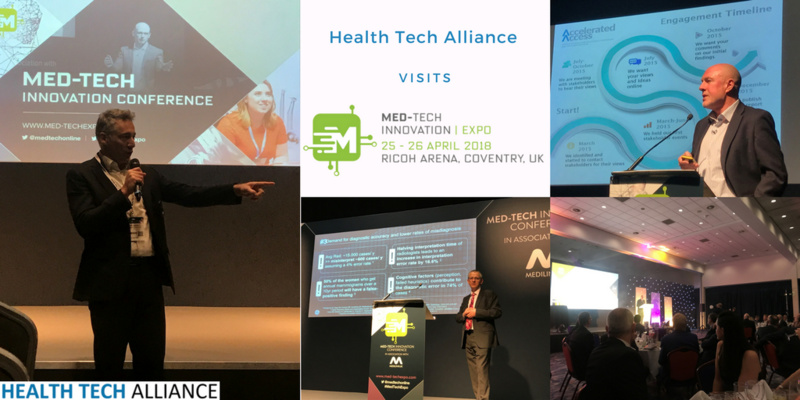 The Health Tech Alliance team travelled to exhibit at the Med-Tech Innovation Expo 2018, held at the Ricoh Arena in Coventry. The Expo provides an opportunity for companies across all areas of the MedTech supply chain to showcase their innovation and hear from leading stakeholders and industry figures on some of the latest trends and pressing issues affecting the MedTech sector. When we weren’t exhibiting, we got the chance to hear from some really engaging speakers, including Max Jones, from GE Healthcare. Max focused on how we can expect artificial intelligence and machine learning to transform the medical profession, as patients are increasingly able to access a wider variety of diagnostic tools. He also highlighted the opportunities presented by AI in what he called ‘an ecosystem of values’, suggesting that by harnessing vast amounts of data, and investing in machine learning and deep learning algorithms, we can build partnerships, develop increasingly accurate diagnostic tools and provide long term value to the stretched health service. Alan Sumner from Roche Diagnostics gave us a great overview of the Accelerated Access Review, an area of great importance to our members. Despite some concerns raised around the limited number of products that are expected to pass through the Accelerated Access Pathway annually, Alan was optimistic for the future, citing this as a starting point that will hopefully expand to a wider range of innovative products. The Health Tech Alliance’s Nicholas Lansman also chaired a session with Liz Ashall-Payne, CEO and founder of ORCHA, the Organisation for the Review of Care and Health Applications, and Mirren Mandalia of J&J Innovation. Mirren told Nick about the need for MedTech companies of all sizes to focus on disease pathways and to address unmet needs, applying their energy earlier to the pathway by looking at preventative care and early interventions. The Health Tech Alliance also had the pleasure of attending this year’s Medilink UK Healthcare Business Awards. The event truly demonstrated what a thriving, exciting and dedicated MedTech sector we have in this country and it was a pleasure to see so many innovative companies be rewarded for their work. We look forward to next year’s Expo, this time at the NEC in Birmingham, and hope to see you there!